The duo Big & Rich have always marched to the beat of their own drum, but now it seems that Big Kenny and John Rich are bucking the musical trends more than ever. 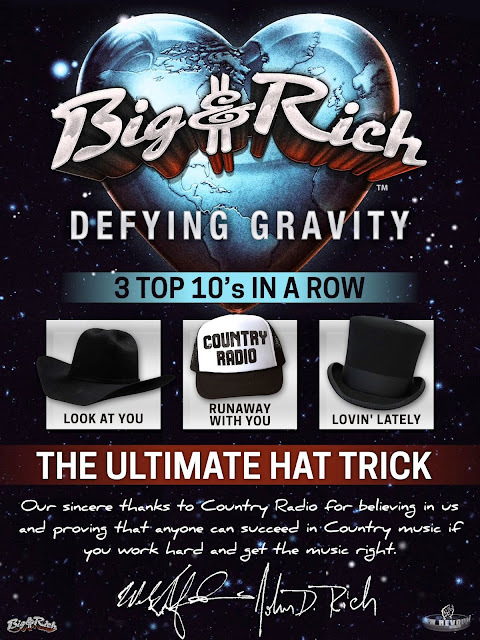 With the entry of their latest single, “Lovin’ Lately,” into the Top 10 this week, the award-winning duo can claim a “hat trick” of three straight singles in that portion of the chart in their decade-plus history. But, the story doesn’t end there. The singles – all from their Gravity album – were released on the group’s own Big & Rich Records label and promoted by their own independent promotion team at New Revolution – a rarity in today’s scene, controlled mainly by the majors. The duo had been part of the Warner Brothers roster for well over a decade when they decided to tackle a new way of doing things business-wise. Rich admits it was a little scary, but it’s paying off quite well. "It's terrifying and exciting all at the same time. You take on all the business and marketing side yourself, but there's a big team of people that we have assembled that are helping us do this. But at the end of the day, our board meeting consists of two guys. If we agree, it will happen, and if we don't, it doesn't."